These famous apes in Indonesia come from the islands of Borneo and Sumatra. You can watch the orangutans in their natural habitat during a nice walk in the rainforests of Borneo or Sumatra. 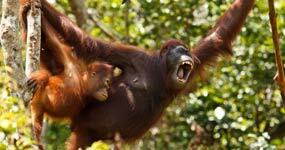 The orangutan is the largest arboreal mammal in the world! Due to deforestation, these mammals have become endangered. Fortunately many reserves are fighting for their safety, health and preservation. For animal lovers, a trip to Borneo cannot be missed! Be careful not to get too close! These huge lizards can grow up to 2.5 meters long and can swallow a buffalo! Endemic to the Island of Komodo, Komodo Dragons were discovered there only 100 years ago and today attract many curious tourists. Long walks are organized to observe these giants in the beautiful landscape of savannah and mangrove. 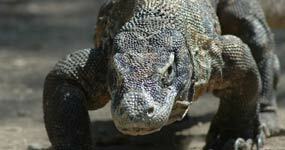 These lizards live in freedom in the Komodo region and nowhere else. Tourists can discover these fascinating creatures in the wild or by visiting the parks on the islands of Rinca and Komodo. There is no need to fear though, as the guides in the parks will always ensure your safety. This imposing animal is one of the rarest in the world. Today, a little more than 40 remain in the Ujung Kulon National Park on the north western tip of Java, Indonesia. This number is the sad result of incessant poaching for rhino horns, which is considered very valuable for Chinese medicine. In the black market, a kilogram of horns can fetch a value of $30,000! 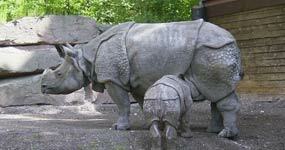 Owing to its rarity, it is also the species of rhinoceros least studied by scientists. 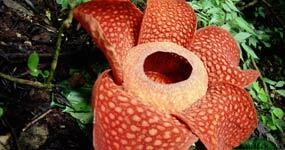 Known as the Rafflesia arnoldii, this is the flower with the world’s largest bloom. This rare flower is found in the rainforests of Indonesia, particularly on the islands of Sumatra and Borneo. This gargantuan flower can measure up to one meter in diameter and weigh up to 10 kilograms. It has no leaves, no stem and no roots! A truly strange flower, the Rafflesia smells of anything but rose. Exuding a very putrid smell of rotting flesh, this flower is sometimes also referred to as the corpse flower!